The US is full of streets named after trees, or simply called “Main,” or given numbers or letters. Washington DC is built on a grid of numbers and letters of the alphabet. I won’t even attempt to explain Salt Lake City. These two schemes reflect an extreme tidiness of mind, but have the disadvantage that they’re easy to mix up or mis-type, no doubt causing the postal service all kinds of headaches. The historical figures named run the gamut from ancient Rome to Aldo Moro, but most of them are men. The few women I’ve noticed are queens, saints, and Maria Montessori (whose image was also on the last 1000-lire note). The older streets nearer the city centers are generally named for older historic figures. 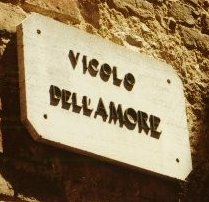 The further you get out into the suburbs, the more modern the names, including some non-Italians. There is a via Washington in Milan, and I have seen several via Kennedys in various towns, and even a via Fratelli Kennedy (Kennedy brothers). Still further out in expanding city suburbs, recently-created streets have been named for Gandhi and Salvatore Allende. 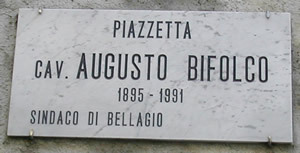 This piazzetta in Bellagio honors a former mayor, whose name”Bifolco” literally means “peasant”, but also carries the connotation of “yokel” or “bumpkin.” Evidently the man outshone his name, being named a Cavaliere (knight, an honorific title nowadays), as well as elected mayor. ^ “Mane,” in the sense of a big head of hair. “Street of the Lost Maidservants.” ??? “Narrow Alley of the Gypsy Women.” I was misled by this at first, because in modern Italian chiasso means “noise,” but a reader corrected me. And here’s an interesting sequence (yes, these streets actually are adjacent to each other). What’s the funniest street name you’ve ever seen (anywhere)? This entry was posted in funny signs and tagged funny signs, Italian culture, Italian food, Italian language, Italy travel on February 16, 2007 by Deirdre Straughan. trying to find out if there is a street called Acanfora? 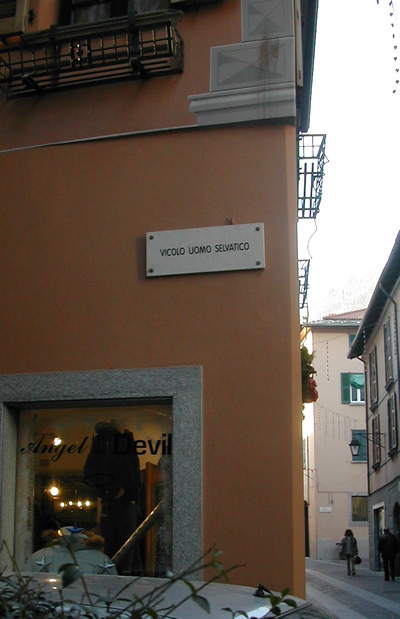 Italian Street Names really are interesting! 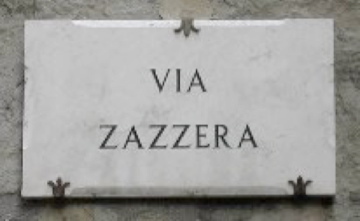 Thank you for sharing that collection of Funny Italian Street Signs. I had fun reading your post. The names wasn’t intentionally be funny right? It’s just that some tend to be coincidentally funny. 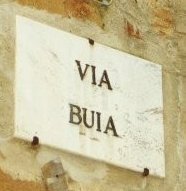 Does anyone know why there are streets in Turin named after 18th December and 20 September,amongst other dates. 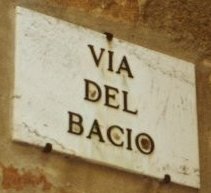 Is there a website that gives a list of ‘date-named’ streets in Italy ? These are historic dates in one way or another, it’d be like naming something “4th of July Street” in the US. But I don’t remember what occasions these particular dates refer to. 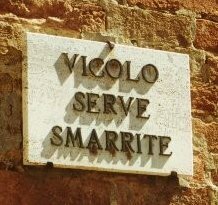 You’ll find a Via Venti Settembre in many Italian towns. From http://it.wikipedia.org/wiki/18_dicembre (December 18th) – In 1922 in Turin, near the Porta Susa Station, Fascists attack squads killed 11 anti-fascist people, dozens were serious injuried. For three days the authorities did not intervene. 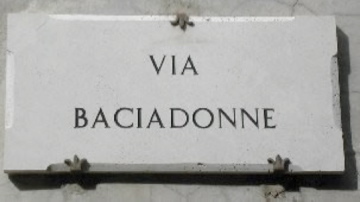 From http://it.wikipedia.org/wiki/20_settembre (December 20th) – In 1870 Italian troops came into Rome through the breach of Porta Pia, thus sanctioning the unification of the country and the end of the temporal power of the Popes.